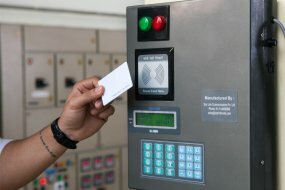 Industrial Model, another state-of-the-art from Star Link serving its purpose of maintaining attendance records of the employee in Industries or big set-ups. The Industrial Model comes in heavy metallic body for dusty and harsh environments. 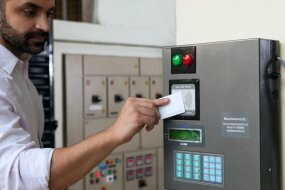 This model is really worthy for access control as it can be used for access control of employees and security guards. It has 62,500 records storage capacity with 9560 fingerprint templates storage capacity. 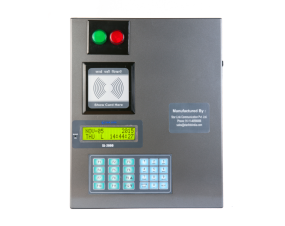 The Industrial Model features LCD display to show the information of the employees where as 2 large lights (Red & Green) indicates the status of the attendance. The built in TCP/IP connectivity helps to get the data with a single click of the mouse. It features heavy duty battery back-up of up to 48 hours, which makes it more compatible with the industrial environments. This device works on multiple operational modes. Industrial Model is available in 3 model, depending on its operational mode. Frequency /Modulation 13.56 Mhz. 125 Khz. 125 Khz/13.56 Mhz. Identification Time Less than 1 sec. Less than 1 sec. Less than 1 sec. Weight 6 kgs. 6 kgs. 6 kgs. Why STAR LINK is ahead of others?